Infrared viewing encompasses a wide range of technologies that gather information using remote sensing in the infrared portion of the electromagnetic spectrum. Early techniques included "active" or "first generation night viewing", in which the viewer illuminated the area of interest with an infrared light, and viewed the reflections. Later technologies, often in different subparts of the infrared spectrum, passively received and amplified infrared-spectrum heat from the target. Not all infrared viewing techniques produce a picture, but may produce matrices that assign wavelengths and intensity information to parts of the field being viewed. For example, Defense Support Program and successor satellites, which detect and track missile launchers, are "staring" arrays of infrared detectors that compare successive views. An intense heat pulse in one location shows the launch proper, but the data reduction system compares the heat in successive views to determine the direction and speed of missile travel. Detection of infrared energy has principally been based on semiconductors, with limited use of photographic film. Among the first uses of infrared viewing were military operations at night. 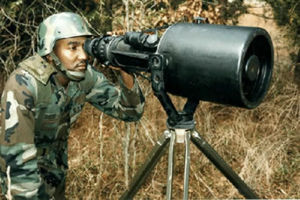 The first infrared viewers were called "first generation night vision", which used an infrared illuminator light, and received reflections from the target. Military night vision moved away from infrared to visible light intensification, also called low-light television (LLTV), which amplified background starlight, but the next generation returned to infrared, but using passive reception without an illuminator, but sensing heat radiated from the target and contrasting with its background. All are monochrome imaging displays, most often green on black, but sometime white or orange on black. Active illumination with reflected viewing was simple, but had high power consumption, and, to an opponent with his own infrared viewer, the illuminator revealed the position of one's own system. The World War II generation was quite heavy; both power consumption and weight were reduced by the Korean War, but were still awkward. "Starlight scopes" of the Vietnam War was much lighter in weight and less demanding of batteries. LLTV still required some light to be present, and could not work through smoke, haze, or mist. Most medical uses are imaging, and are displayed as false-color. This page was last modified 18:29, 18 November 2013.